A descendant of “Commedia dell’ Arte”, Italian Comedy is generally considered to have started with Mario Monicelli’s “I Soliti Ignoti” (Big Deal on Madonna Street) with Vittorio Gassman, Marcello Mastroianni, Ugo Tognazzi, Alberto Sordi, Claudia Cardinale, Monica Vitti and Nino Manfredi. They were the stars of these movie flicks, which described the years of the economical reprise. In 1961, Dino Risi directed “Il Sorpasso”, now a cult-movie, then “Una Vita Difficile” (A Difficult Life), I Mostri (The Monsters, also known as 15 From Rome), “In Nome del Popolo Italiano” (In the Name of the Italian People) and “Profumo di Donna” (Scent of a Woman). Monicelli’s works include “La Grande Guerra” (The Great War), “L’Armata Brancaleone,” “Vogliamo i Colonnelli” (We Want the Colonels), “Romanzo Popolare” (Popular Romance) and the “Amici Miei” Series. On the lighter side of Italian cinema, we’d find “Toto” whose sidekick is Peppino de Filippo or Aldo Fabrizi. There’s Franco e Ciccio even if they’re unknown in the US, they seem like their popularity has spread across the eastern borders of Italy. Their fame traveled from the Middle-East to Russia and they even extended their talents to India. At the same time, “Spaghetti Westerns” (Italian western) began their claim to fame. They grew with great success, yet, with different style, than films of the past. And their success spread not only around Italy, but also throughout the world. They differed from traditional westerns, not only because they were low-budget and filmed in Italy, but also because they had a unique and vivid cinematography. The most significant and popular spaghetti westerns were Sergio Leone‘s “Dollars Trilogy”, consisting of “A Fistful of Dollars”, “For a Few Dollars More” and “The Good, the Bad, and the Ugly”. This film also featured Clint Eastwood and scores by Ennio Morricone. This defined this genre, along with “Once Upon a Time in the West”. Following the popularity of the Spaghetti westerns on the style of Sergio Leone, came a sub-genre of westerns with a comic nuance, a mixture of the traditional western ambiance with the comic tradition of the “Commedia all’Italiana”. Included are such films as: “Lo Chiamavano Trinità” and “Continuavano a Chiamarlo Trinità”. These films featured Bud Spencer and Terence Hill, the stage names of Carlo Pedersoli and Mario Girotti, respectively. This Italian gore-style is known collectively as “Giallo” (which means yellow in Italian). During 1960’s and 70’s, Italians filmmakers Mario Bava, Riccardo Freda, Antonio Margheriti and Dario Argento developed horror films (belonging to the Giallo genre) that soon become classics and influenced other countries. Characteristic films include: Black Sunday, Danza Macabra, Reazione a Catena, L’Uccello dalle Piume di Cristallo, Profondo Rosso and Suspiria. Following the 1960’s, there was a boom of “Shockumentary Mondo Films” such as Gualtiero Jacopetti’s “Mondo Cane.” During the late 1970’s and early 1980’s, Italian cinema became the international creator of violent horror films. Between the late 1970’s and mid-1980’s, Italian cinema endured a long period of crisis. During this time, “Art films” separated from mainstream Italian cinema, which once were made to work in unison. Among the major artistic films of this era were: “La Città delle Donne,””E La Nave Va”, and “Ginger and Fred” by Fellini, “L’Albero degli Zoccoli” by Ermanno Olmi (who was winner of the Golden Lion at the Venice Film Festival), “La Notte di San Lorenzo” by Paolo and Vittorio Taviani, Antonioni’s “Identificazione di Una Donna” and “Bianca and La Messà” by Nanni Moretti. Although it’s not entirely Italian, we may include Bertolucci’s “The Last Emperor”. This film won nine Oscars! And finally, but not leaving it out, there’s Sergio Leone’s “Once Upon a Time in America”. What were once considered “trash films” reached the Italian public nevertheless, raking in great successes, even though they were considered films of little artistic value. 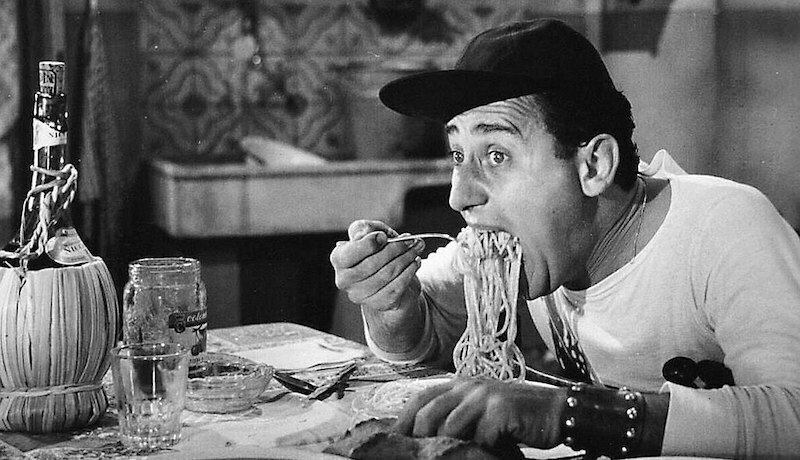 By confronting Italian social taboos, these comedies reached their popularity, but could only notably be placed in the sexual category. Several actors including Lino Banfi, Diego Abatantuono, Alvaro Vitali, Gloria Guida, Barbara Bouchet and Edwige Fenech owe much of their popularity to these films. It has now become a tradition: just before Christmas a “cinepanettone” is shown in all Italian cinemas. Also considered part of the trash genre are the group of films belonging to the “Ragionier Fantozzi“, who happened to be a comic figure invented by Paolo Villaggio. This character strongly influenced Italian society, and to such a degree that the adjective “Fantozziano” was entered into the dictionary. Many misadventures took place in the Fantozzi films, and the two most notable of these movies were “Fantozzi” and “Il Secondo Tragico Fantozzi”. New Emerging comic actors with new styles were Pippo Franco, Renato Pozzetto, Luigi Proietti, Enrico Montesano, Carlo Verdone. There were several artistic movies which won international awards during this time period such as: “Nuovo Cinema Paradiso” for which Giuseppe Tornatore won an Oscar for “Best Foreign Film” in 1990. Another was Gabriele Salvatores’s “Mediterraneo” (also a comedy), and in 1998, Roberto Benigni won three Oscars for his movie (Best Actor, Best Foreign Film, Best Music- also a black-comedy) “Life Is Beautiful” (La Vita è Bella). In 2001, Nanni Moretti’s film “La Stanza del Figlio” (The Son’s Room) received the Palme d’Or at the Cannes Film Festival. Modern comedians join in: Leonardo Pieraccioni in “Il Ciclone” which was a high-earning success, Aldo Giovanni e Giacomo a cabaret trio turned actors, Checco Zalone. New directors like the Vanzina brothers propose a new set of films, “Le Barzellette” and “In Questo Mondo di Ladri”. Some old movies ara available online. f you would like to watch a full Italian movie on youtube, look up “film completo”. The quality is not the best, but you have the chance to enter into an Italian environment for a couple of hours.